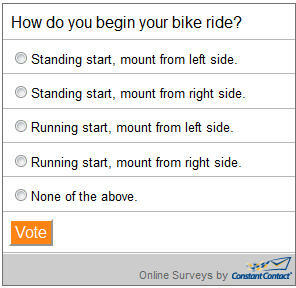 Century Cycles Blog: Online Poll: How do you begin your bike ride? How do you begin your bike ride? Most people step over the bike from one side or the other, then put one foot on a pedal to get going from a standstill. Some people, however, like to put one foot on a pedal, and then throw a leg over the bike while doing a "running start." Which do you prefer? Click here to take our latest online poll and let us know! Last month's poll asked, "What is your favorite kind of bicycling?" The top two answers, "Road" and "Bike Paths" were almost dead even at 46% and 45% each; "Mountain Biking" came in a distant third at 8%. You can see the full results of the last poll.